When people encountered Pope John XXIII for the first time, the thing they most noticed about him—apart from his physical appearance—was the sense of peace and serenity that emanated from his countenance. He was, essentially, a man who was at peace with himself and with the world around him. It would be wrong to think that he came about this serenity easily. He was naturally a happy and good-natured person—full of life and laughter—but the spiritual disciplines he had imposed on himself since his youth helped to further that serenity and peace which people found so appealing and so comforting. After all, his episcopal motto had always been Obedientia et Pax: Obedience and Peace. So it was unusual whenever the pope fretted over anything. It just so happened that on March 11, 1962, Pope John was fussing, really fretting, over something. He was trying, in his mind, to reconcile a dilemma—while not a serious one—that caused him not a little worry. “Good Pope John”—as he was known by now—was steadily pacing around the room in the apostolic palace that was the papal library, a site that was often used for public audiences with important and special visitors. The idea that Pope John would be upset in any way was unusual. The only other comparable time was when he found himself elected pope back on that October night in 1958. In those early days of his papacy, he found it hard on one night to sleep. On that particular night, he was tossing and turning over some matter in his mind, an issue that had come before him since he was now the pope. He woke up, worried and restless, and thought to himself, “Very well, I shall talk this over with the pope!” He was very pleased with himself, and about to turn in again, until he realized that the man he was going to confer with, the man who was the pope, was…himself. Recognizing that, he figured: “I’ll leave it to the Holy Spirit.” Pleased and comforted by that thought, John was able to get back to sleep. So, when Monsignor Loris found Pope John in such an agitated state on that March day in 1962, he inquired as to why. It turned out on this day, the First Lady of the United States was to be received in audience by Pope John. Jacqueline Kennedy was the wife of the president of the United States, John F. Kennedy, the first Catholic ever to assume that august office. Naturally, this meeting was to be of special importance for all concerned. Pope John wondered how he would address the wife of the president. Pondering this problem that perplexed the pope, Monsignor Loris simply said that since the First Lady, being half-French, knew and spoke French, why not converse in that language? That reassured John, who spoke the language well from his days as papal nuncio to Paris after World War II. That solved the language problem, but something else remained: particularly, how would John address her? Monsignor Loris again came to the rescue. He noted that since the pope would speak French with the First Lady, he could address her as “Madame.” Or, he could simply address her the way the Americans did: “Mrs. Kennedy.” Now, that presented another problem: which salutation would John use when meeting her? That, however, would be left up to the pope. With all of the issues a modern pope must deal with, it seemed that the matter of how to address a president’s wife was a trivial concern, but it wasn’t. The election of John F. Kennedy as the first Roman Catholic president of the United States back in 1960 was of huge importance to those who shared his Catholicism. While it was a source of pride for his co-religionists as well as for those who were immigrants or the descendants of immigrants (like the Kennedy family), JFK’s election was also a cause of some concern for those who were worried about how his presidency would affect the nature of church-state relations, which played a major (and not always a pleasant) role in the development of American history. 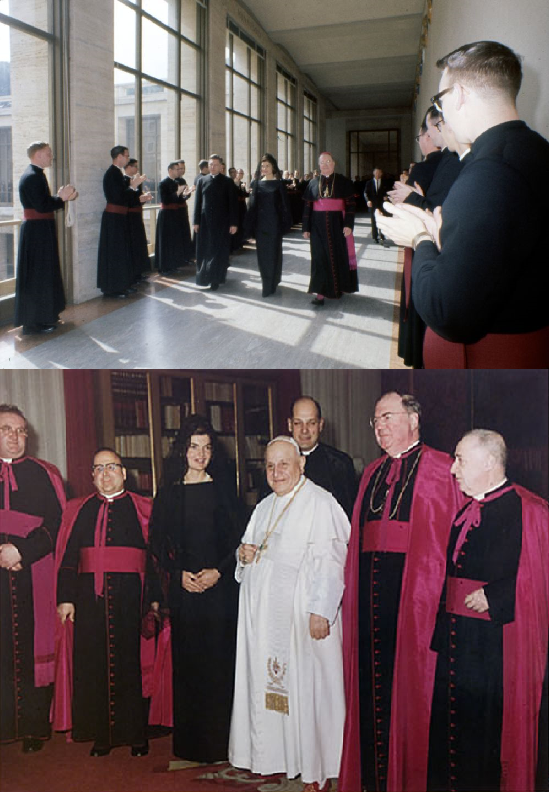 Pope John XXIII was waiting, and so was Mrs. Kennedy, attired, as papal protocol required, in a simple black dress, with an accompanying black lace mantilla, which covered her head and shoulders. She did not wear any makeup; and her only adornment was the three-strand pearl necklace, and she carried a flat black silk purse. Pope John was present in the papal library, situated in the middle of the floor, where he could get a good look at the doors that were about to open for him. And with that, the meeting was over. But her trip to Rome and the Vatican wasn’t completely over. She found time to visit the North American College, where seminarians from North America come to Rome to study for the priesthood. It was there that she was given an ovation by the seminarians lined up on either side of the hallway as she processed alongside her official escorts. At the college, she had a 20-minute meeting with Amleto Cardinal Cigognani, the Vatican’s Secretary of State. The Kennedys and the cardinal had a long acquaintance in Washington, back when the cardinal had been the Vatican’s apostolic delegate for 25 years. There would not be a meeting comparable to the Pope John and Mrs. Kennedy audience until April 1985, when another young woman with a “sweet-shy” expression would entrance a Vatican assemblage. On that occasion, it would be Diana, Princess of Wales, accompanied by her husband, Prince Charles, in a 35-minute encounter, with a beaming Pope John Paul II between them. At that time, both the prince and princess gave the pope large signed photographs of themselves, along with Bede’s Ecclesiastical History of the English People. And the photographs from that audience showed a somewhat awkward royal couple with a pope who obviously enjoyed meeting them. So, the visit went off without any problems and everyone concerned was pleased. When it was done, Mrs. Kennedy was able to put away the black dress and veil, along with happy memories—but unknown to her, in 18 more months she would have to wear them again, but this time for the funeral of the president of the United States—her husband, John F. Kennedy. And as for Pope John, he, too, would be dead, expiring the year following that audience, where he had spread wide his arms, and bid welcome to the woman in the doorway. This is the third in a series of vignettes on the popes and the presidents. These stories are presented to offer some historical background for those interested in American and Catholic history, ahead of the first visit of Pope Francis to the United States.